Note: Very limited seats available! Today I want to introduce you to a different kind of yoga. One that is much more rare here in the western part of the world than what you would find in the vast majority of yoga studios out there. 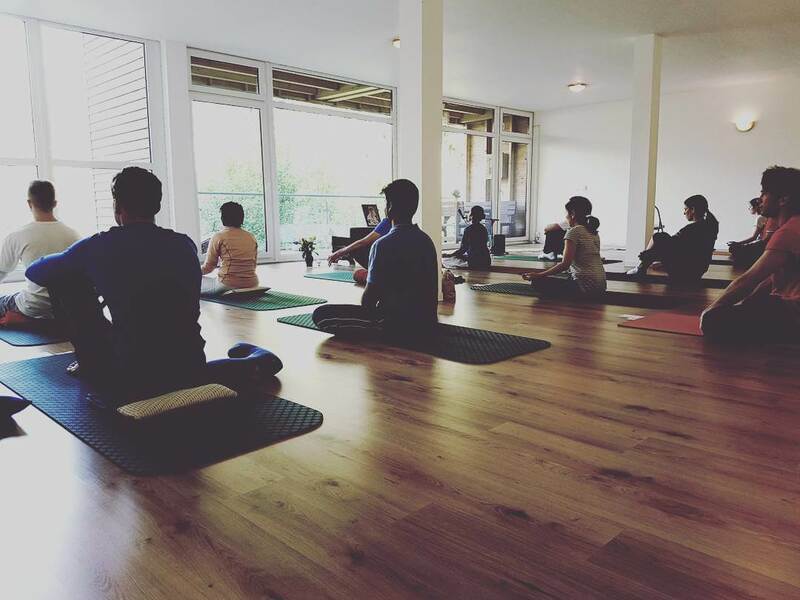 It is a dimension of yoga that I myself got introduced to only during the three years I lived and learned Yoga in India and to be quite honest with you, it is a dimension that I don’t yet feel quite qualified to even speak about. Yes I am qualified to teach you how to practice it, but it’s a different story to completely understand the science behind it. So I will leave it up to Sadhguru to introduce you to this ancient yogic technology called Bhuta Shuddhi. Then if you want you can join me on this journey of exploring the various dimensions of the Yogic science. Sadhguru: “Every yogic practice, whatever kind it may be, is essentially drawn from the process of Bhuta Shuddhi. If you do an Asana, Surya Namaskar, Surya Kriya, Pranayama or a Kriya, in a way, you are doing Bhuta Shuddhi. In other words, you address life in its most fundamental form, which are the five elements. You can address life just as body. You can address life as prana or life energy. You can address life on the cellular level. You can even address life on the atomic level. Or you can address life on the elemental level, which is most fundamental. Yoga is an attempt towards that. It is these five elements that make up this body, this planet, this solar system, and the universe. Each of these five elements has its own individual nature, and all of them are capable of absorbing and retaining information. The whole system of Bhuta Shuddhi has evolved from the knowledge that the five elements can take in and hold information. If information is properly put into anything, it also creates an intention. Depending upon what kind of information you hold about something, you naturally develop a certain intention towards that something. Once you have an intention, you start moving in that direction. It is this basis that gives Bhuta Shuddhi its effectiveness and its ability to transform a human being in miraculous ways. The intention behind Bhuta Shuddhi is that slowly, over a period of time, the elements within you should take instructions from you. Once you have the ability to make the elements within yourself function the way you want them to, it is not far away to impact the elements around you. Often unconsciously, unknowingly, unintentionally, human beings are doing some kind of Bhuta Shuddhi. To give an example – there are political leaders who, if they enter a space, change the atmosphere around them by their sheer presence. There are many people – not only spiritual ones – who, when they walk into a room, change the atmosphere there in an instant. This is a certain amount of Bhuta Shuddhi, performed unconsciously. If you can do it consciously, it is far more result-oriented. There are other aspects of energy that one can in influence and thereby change the atmosphere, but this does not impact other people as profoundly as when the elements rearrange themselves because of a certain presence of energy and intention. The idea of practicing Bhuta Shuddhi is to rearrange the way the elements function within you. You want to change the intention with which they function within you. If the elements within you function in the same way as they function in the earth or a tree, it is not useful to you. In the human system, the elements function in a particular way. We want them to function that way and to transform themselves into higher and higher possibilities. When you chant the Bhuta Shuddhi mantra and take the elements – earth, water, air, and fire – into yourself, you try to influence how they function within you. It is important to be deeply focused towards that. You try to impart a certain amount of your consciousness on the elements that you take in – they should enter you with a certain memory. If you take in this tiny ball of earth, the earth dimension of your body and this tiny piece of earth naturally communicate. Today, science is getting very close to this, and in the yogic system, it is a well-established fact that the elements communicate with each other and integrate themselves. When you take in the water, this water communicates with the water dimension within you. It is important to put a little bit of your consciousness into the elements. When you utter the mantra and say, “Yogishwara,” it means “one who has broken his boundaries.” A yogi is one who has achieved a certain union with existence. He has obliterated the boundaries of his individual self. You are calling for Yogishwara because this is the nature of life. For what you consume, what you eat, what you breathe, and what you drink to integrate itself into your system, you have to achieve a union with it in some way. Otherwise, this little piece of earth that you take in can get into conflict with the rest of your system. Many times, it may have happened to you that you ate a certain type of food, and it knocked you out for the day. If you cannot break the barrier and integrate this food as a part of yourself, it will naturally work against you. During the Bhuta Shuddhi process, you are calling for Yogishwara, the Boundless One, because when you take something in and the boundaries are strong, the little thing that you take in could be your death. This is how traditional poisons work. When you take this kind of poison, it stays in the body but never becomes part of the body. It will create havoc in the system because it will never integrate itself. Then you call, “AUM Sadhguruve.” “Sadhguru” means “one who comes from within.” There is an intelligence within that allows whatever integrates into the system to function as a human form. Sadhguru stands for the intelligence that guides you from within. Some remnants of different stages of evolution are still present in our system. You know, there is a reptilian brain, and your DNA is only 1.2% away from that of a chimpanzee. When a small deviation happens in the functioning of the fundamental intelligence within you, it causes complete havoc in your life. It may manifest in many different ways – not necessarily physically. That is why we call for the intelligence within us to function well, towards the goal that we seek. Subsequently, you call Bhuteshwaraya, “one who has mastery over the elements.” We are calling him or that dimension. How well we integrate the elements into the system determines what kind of human beings we become. This is the technology of creating a new creature altogether – not the kind of creature who causes pain and suffering to himself and everyone around him, but the kind of creature who is 100% in tune with the life process. Once one is absolutely in tune with the life process, a certain ease will come. It is only because a total ease is not there in people that we have to torture them with systems of meditation, that we have to make them sit still. If everyone was at absolute ease with the life process within oneself, there would be no need for any meditation. There would be no need to sit with eyes closed. When the eyes are open, when they are engaged with life, there are different levels of dis-ease. To settle that, you make people sit with eyes closed. But if you integrate these five dimensions properly and they function absolutely in tune with the inner intelligence that is the source of creation within you, there would be no need for any kind of meditative process. We are far away from that, but if people could always be at ease with everything, there would be no need to sit and meditate. Sitting still and meditating has a phenomenal benefit, but at the same time, if the only way you can be still is by keeping the physical self still and bereft of activity, it is fine, but it is an inefficient way of functioning in life. If you could be intensely engaged with everything and yet be absolutely still within you, that would be a more efficient and life-oriented way of being still. If your stillness is not life-oriented, obviously it will become death-oriented. If stillness becomes death-oriented, there will be peace, but there will be no life. In that context, establishing a certain level of Bhuta Shuddhi or purification of the five elements before you go into deeper dimensions of meditativeness will give you the capability to sit still for some time, and when you come out, you can be dynamically active without getting entangled with the world around you. Not developing this capability, that you can be absolutely still within you and yet be very active in the world is, for want of a better word, a certain disability. If to be still, you have to sit still – you cannot move, you cannot act, you cannot be involved, you can only be withdrawn – it is a wonderful state, but still there are better ways to be. The basis for all creation, including the physical body, is the group of five elements: earth, water, wind, fire, and space. The wellbeing of the body and mind can be established by purifying these five elements within the human system. This process also shapes the body into a stepping stone towards one’s ultimate wellbeing.